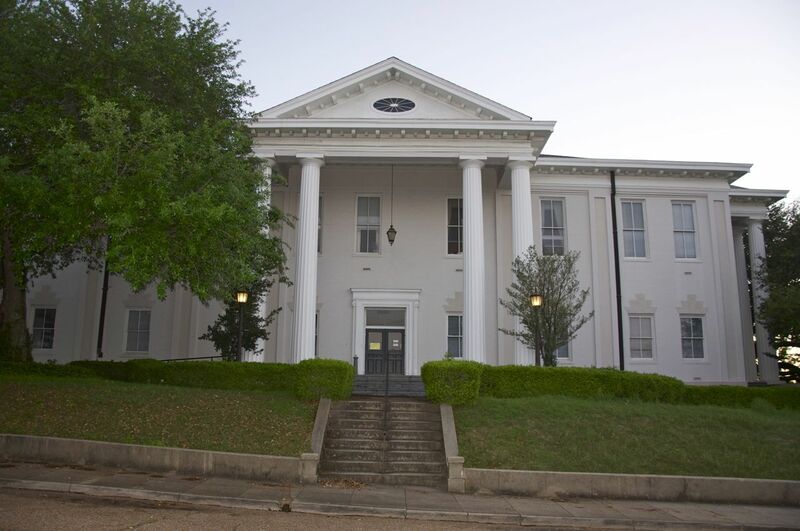 The Adams county courthouse in Natchez is the oldest courthouse in the state in continuous use. It was built in 1821, and is one of five Antebellum courthouses in Mississippi. Thanks to Thomas Rosell for correcting my error on the five counties. 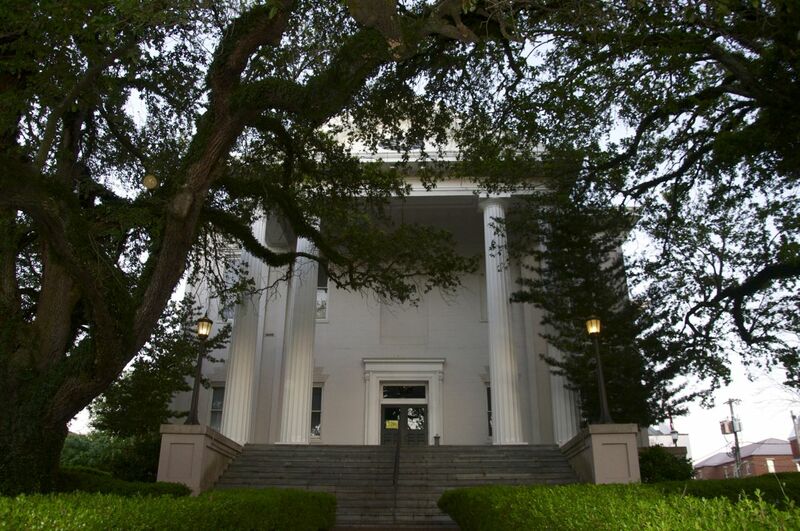 The counties where the Antebellum courthouse is still in use as a courthouse include Adams (Natchez), Amite (Liberty), Claiborne (Port Gibson), Hinds (Raymond), and Monroe (Aberdeen). The building is interesting in some odd ways to me. For example, the window over the door is not centered over the door, and yet, there is no evidence that there was ever a fourth window above the doors. At the side entrance, two windows have been sealed. At this entrance to the building, the windows were centered (even though the one over the door has been sealed), but the door is located behind one of the columns instead of centered between them. I found that odd. There is no first floor window on the 3rd window to the right of the door, either. It just seemed to give the building an odd look. I am not all that into symmetry, but for it to occur every where in the building except for a few places seems unusual to me. Maybe there is no rule that says a door has to be centered, but it still seems odd to me, unless there were two sets of doors, which would then be centered even if not visible behind the columns. 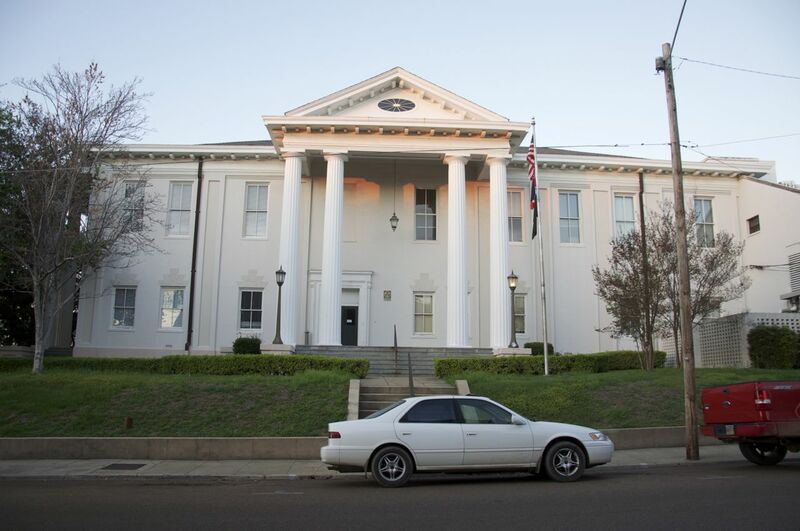 While I can’t explain it, I can say I have seen it: the oldest courthouse in Mississippi. This entry was posted in Courthouses and tagged Adams County Courthouse, architecture, Mississippi, Natchez. Bookmark the permalink. The antebellum Adams county courthouse is burried under that 1920 renovation. I think that the list of five antabellum courthouses is supposed to be of those that are still in use, because I know Madsion and Warren counties still have their pre-war courthouses but they are not used as the county courthouse anymore. I’ve never noticed that the symmetry is as odd as it is. Thanks for pointing it out! I did find a brief mention of the “renovation” but could not locate anything else, so thought it might have to do with changes that occurred as a result. I am correcting the above entry on the list of 5–thanks!